I've known about Liza Lambertini's extraordinary goddess & fairy art for some time now (she designed the gorgeous "Twixt" silhouette based on Chapter 20 "Dancing with the Moon" from my novel Twixt). 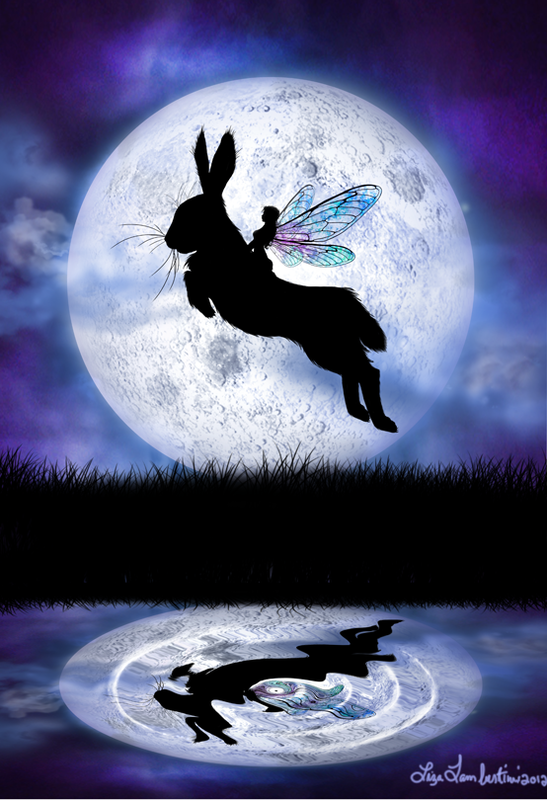 So when the Spring Equinox was approaching, I was just dying to see some of her new seasonal pieces & hear about how she creates her whimsical & enchanting artworks. The following is my interview with Liza about her creative process & inspiration as well as her magical philosophy about art in general. You can also visit her spectacular website to see more of Liza Lambertini's artwork at www.faeriewood.com. Hi Liza—thank you for visiting Bandits Ranch! I'd love to ask you about how you became an artist. How old were you when you began to get an inkling that you were artistic? And what were your earliest artistic influences? I believe I fell in love with my first box of crayons the day they were introduced to me. From the moment I could “wield” my hands properly (which I dare say was quite frustrating when I knew what I WANTED to do, but my little hands just were not doing what they were told), I loved to draw. I do recall that because I was so enamored with the small box of crayons, and then I was given the BIG box of crayons (which of course sent me into a creative fury and out popped a fairy! :D ). Had anyone dared touch one of my crayons, I would promptly give that person a dirty look due to the fact that I did not have many words in my vocabulary. My grandmother raised me because my mother was a single parent and had to work to support us. My Nana encouraged me to draw once she had seen how happy it made me. I believe it was my mother who had gotten me the BIG box of crayons. 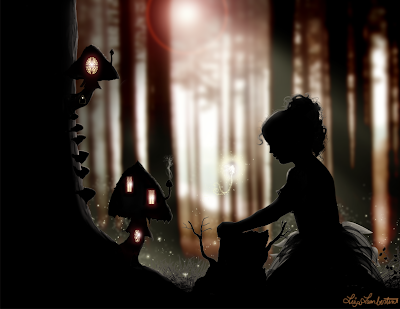 Did you always have an affinity with fairies and enchantment as a little girl, or did that develop more slowly over time? Do you have any favorite fairy tales or stories? Why do they resonate for the artist in you? When I was but a wee baby, I would stop and look up & point in the air. My grandmother would look & not see anything, nor would my mother, but they both believed I saw faeries. Originally it was my grandfather who'd told stories about faeries, and this was passed on to me from them. The stories they told were about little people who are kind to all of nature, wildlife, and children. I just naturally gravitated to that because I loved nature from the moment I first opened my eyes. The faery stories my mother & grandmother would tell me will always be my favorite. They are not written in any book—they are in my heart. That was one of the best times of my life, and it also honored my grandfather as well who I have an uncanny connection to, even though I never knew him personally. 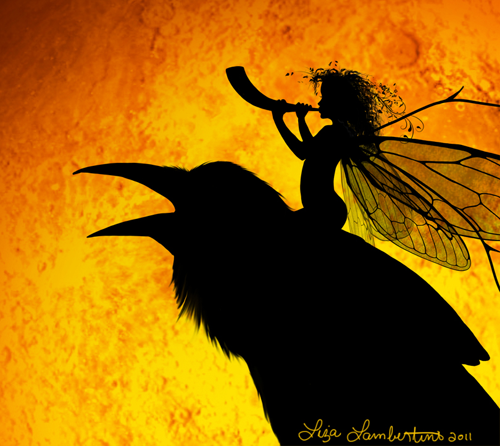 The nature faeries in the Disney film Fantasia felt right to me because it correlated with the stories I had been told as a child of little gossamer winged people who danced and sang while caring for nature. They are conveyed as having an integral part of nature's health. That is what I love most about the film. I can't remember a time when I did not have a love/affinity for the faeries. I also believe I was switched at birth (and I've been trying to get back there ever since!). 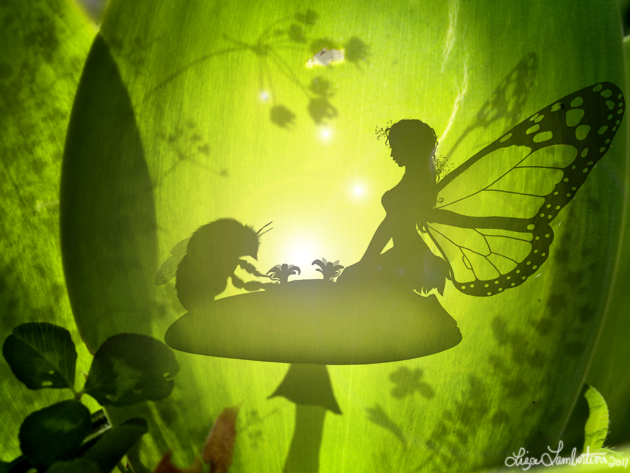 Faeries really resonate for me because I know there is real magic in nature. I have witnessed it time and time again—not only during childhood, but even now in my adulthood, too. As a co-creator with creation, I believe this is my calling. Thus far, many things I have created do happen in real life—undeniably and “naturally”. What were your favorite mediums to create art with when you began experimenting as an artist? Have your favorite mediums changed over time? I like all mediums and have worked with most of them with the exception of oil pastels. Acrylics I tend to lean towards simply because they dry quickly. I also love watercolor, and I dabble in sculpture now and again. But my favorite medium is my art tablet and pen. I draw directly into my computer, and I find it both relaxing and exciting both at the same time. I have been working in Photoshop since the WWW came into popularity (give or take a year or so), and when dial-up was the only option. I taught myself Photoshop. 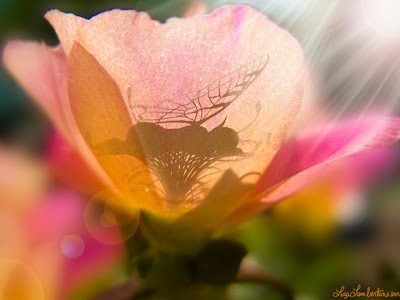 When did you begin to get interested in silhouette art? 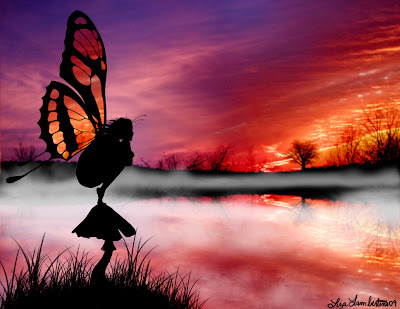 I have always loved silhouette art since I was a child. I recall going into antique store with my grandmother. She loved “window” shopping. 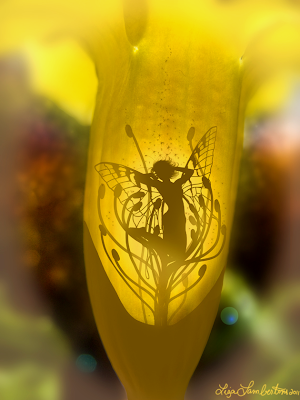 I remember seeing vintage silhouettes of nymphs and fairies that I fell in love with. Dusk and dawn are so beautiful to me in nature—I feel captivated by the way the contrast of the trees and the sky boldly accentuate each other. It is a magical time for me. As far as devoting myself to becoming a silhouette artist? Gosh, so many years have passed since that first day I mustered up the courage to even try. I had a vision that was insistent, but I did not feel that I was good enough and I was so terrified I would fail at it . . . especially because I was giving up one way of doing art that really did not call to me (even though I made money at it) to do something that really does call to me—it meant I had to start all over. It also meant taking a chance, making a change, and facing fear to get past all that and to simply do what I love. Today, I have a deep respect for artists who have the courage to create what is truly in their heart and who seek not just monetary gain but fulfillment & joy. As one of my fellow artists says, "Art is bravery on display" (Victory @Victoryarts on Twitter). Do you have any formal training as an artist, or are you mostly self-taught? This question always sticks in my craw . . . or caw, caw, caw. (Um, clearing throat—raven popped out for a second!) I consider myself to be formerly trained by me. I believe I am born an artist & am learning all the time. Art is a life long journey for me. It is the path of discovery. What has been the hardest part of your artistic journey, and what has been the most rewarding part? The hardest & saddest part of my artistic journey is dealing with jealous people who saw my unique vision and wanted to copy it for themselves. When I first made my work public I was putting out more than just magic and a “good idea”. I put out there something that I truly believe is my salvation. The most difficult part of this journey is feeling used by people & treated poorly when what I have to bring to the table is filled with magic, positivity, and light. It's also very hard when I've been purposefully excluded by jealous or insecure people, especially when my art is healing—and I believe it really does have that kind of magic in it. My work is my soul bared and my inner-child’s greatest hope. It is the opportunity I did not have until I was old enough to give it to myself—the opportunity of healing and that of having a career. But the most rewarding thing is seeing growth within myself as an artist/human being and having what is truly in my heart show itself to the world. I love those moments when I touch people's lives with my work, or when something magical happens after I've created a piece. And when people inspire me, it is very rewarding since I am a social being by nature. Gratitude does not even begin to express how I feel about my customers, supporters, and kindred souls. Every once in a while I hear you talk about your "muse." Can you describe what inspires you, and how you go about creating new pieces? A vision pops into my head and it does not leave unless I create it. Nature really inspires me. I can say that she is the greatest muse of all to me. However, I also draw inspiration from many places. Kindness inspires me. When a person is good to me, some quality that I see which is beautiful about them will inspire me. People inspire me a lot—you certainly have, Diane. 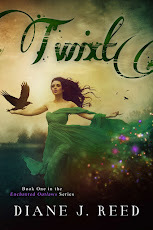 I would not have been able to create an artwork for Twixt if I did not know you a bit first & then read your book. People who are good to me are an inspiration always! 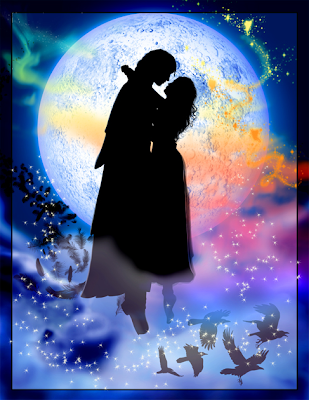 Twixt—a scene from "Dancing with the Moon"
In addition, much of my art is born of gratitude. Gratitude is very inspiring : ) Children inspire me, as well as music, song, dance, literature, poetry—inspiration is everywhere! Sometimes it just pops into my head out of nowhere. When I did the piece below of my muse sleeping in a flower, it was because I had no inspiration and she was all tuckered out. I figured okay, I’ll just draw her sleeping! : ) I didn't create for a while after that. I think muses need a rest too, and I learned if I wake her up too soon, she is really cranky. WHO KNOWS what I’d be creating if I wake her up too soon!!! (LOL) So I learned to have compassion for my muse. She has been with me since that first crayon, and I hope will be with me for the rest of my life. You also write beautiful poetry to accompany many of your artistic works. What comes to you first, the lyrics or the artwork? Thank you! The art always comes first. Sometimes it feels like I am in a trance-like state when creating, and once completed, I awaken to look at the art who then tells me a “truth” which often is in the form of a poem. That's so lovely! So how do you fill up your "emotional well" and put yourself in a mood to create your gorgeous artworks? Do you meditate, go out in nature, listen to music? Spirituality and a sense of the sacred just naturally seem to come through in your artwork—do you have tips for cultivating your soul & creativity that you can share with others? My “well” is not something that I can fill up by myself, so it is not something that I have control over. I believe in a natural process. For example, one of the questions you asked me above is what inspires me? I took a break while writing this and went outside. Wouldn’t you know my opossum friend comes walking up my front porch steps while I'm standing right there? (Talk about timing!) I had to say something to her, lest she climb over my feet or up my leg. She sniffed my slipper & was so relaxed, as was I, about the encounter. Nature is very kind to me & I am kind to nature. I find being in this space is the best place I can be in artistically. It lightens my heart & my attitude changes as well. I believe that nature speaks to me—experiences like this always happen, and because I feel such gratitude inside to hear “the voice” in accordance and harmonizing with my own, it inspires my work. I feel such compassion for nature, and I would say my art is my way of “scribing” & creating magic. Some people pray, some use herbs and chanting, some people meditate. I do not think it is the same for everyone, and I do believe that not everyone is born with these abilities. I believe we're all chosen at birth by something sacred for specific purposes—this purpose is also meant to support our lives & contribute to our families and society. For how else can the journey continue & be shared without support? That is what I believe in, because that is what I have been taught by nature. I trust that. I have no tips to give anyone simply because it is not the same for everyone. I do feel being unique & different is a privilege! Diversity is beautiful to me—something that I take seriously & honor within myself. Lovely Liza Lambertini with her winged friends . . . Thank you for this interview, Diane. May the Sacred shine upon you for giving me & the magical ones this opportunity. 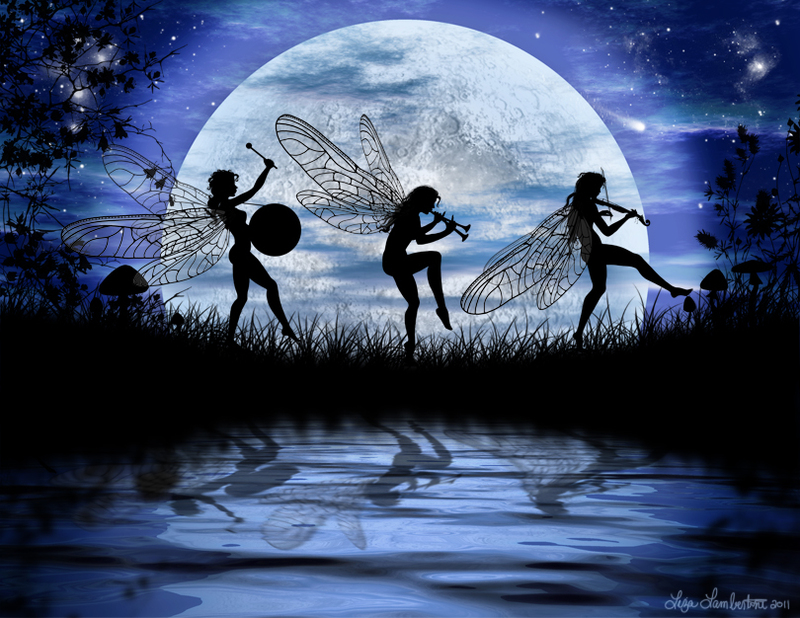 Faery Blessings! I just loved the artwork!!! It's so enchanting and has a way of making you feel the reality of magic. 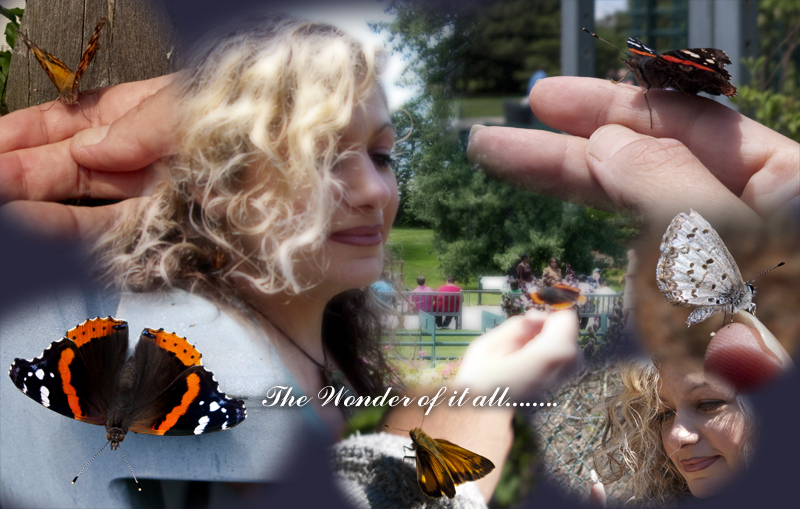 My favorite is titled "Wonderment". It captures the essence of a child's wonder and for a moment, makes you see the world through their eyes. Thank you Liza Lambertini for bringing to life such endearing images!!!! Thank you for sharing with us, Liza. I wonder, given your Italian last name, if your grandfather might have been sharing with you about the Lare? The Italian side of my family--as Catholic as they may be--still have little habits and quirks surrounding these benevolent "house spirits"--you might find it interesting and I'm sure there's stuff out there to google. Thank you Diane:) Blessed be and the luck O the Irish be with you! Hi Diane, I posted a request for a reading in the request a reading post..
Hope you saw it please ? Thanks. Liza's artwork is amazing. It seems to give off its enchantment and magic as you look at it. I especially love her artwork of "Dancing with the Moon" from Twixt, that is one of my favorite parts of that book.